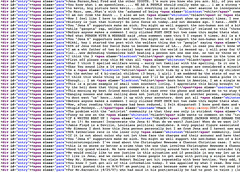 Click the first thumbnail below to see the source text for the project; a sizeable portion of the 3,000+ comments harvested from my own site and videos I posted to youtube. Below, you'll see examples of two "mappings" in which comments were mashed-up with select croppings from photographs. These mappings were further cut-up to produce images that comprise the Projection.